It's taken a very long time for King's Cross to be seen as a solution rather than a problem. Today, London's dynamic post-industrial district brims with cranes. With a new postcode, NC1, the area is home to new flats, restaurants, Central St Martins college, one of Britain's most respected media companies, the Guardian; and will in a couple of years also host Google's UK headquarters. For hundreds of years King's Cross was synonymous with sleaze, as one of London's most notorious red light districts, and urban deprivation (see the streets coloured black on Charles Booth's poverty maps). The creepiness of the place persists today in some of its back streets and yards. A young Thomas Hardy had a job moving the graves at St Pancras Old Church when the railways ploughed through the whole area in the 1840s to 1860s. Bodies were snatched for medical experiments in the Victorian period too. That same spirit of destruction the railway engineers practised is evident in the 1931 King's Cross Airport plan by architect Charles Glover, who put forward the idea of installing eight runways over the district's skyline, an urban airport in the shape of a cartwheel accessed by lifts. He wouldn’t have dreamed of suggesting such a thing over the buildings of Mayfair – but King’s Cross was a place where it seemed just fine. It was certainly visionary. 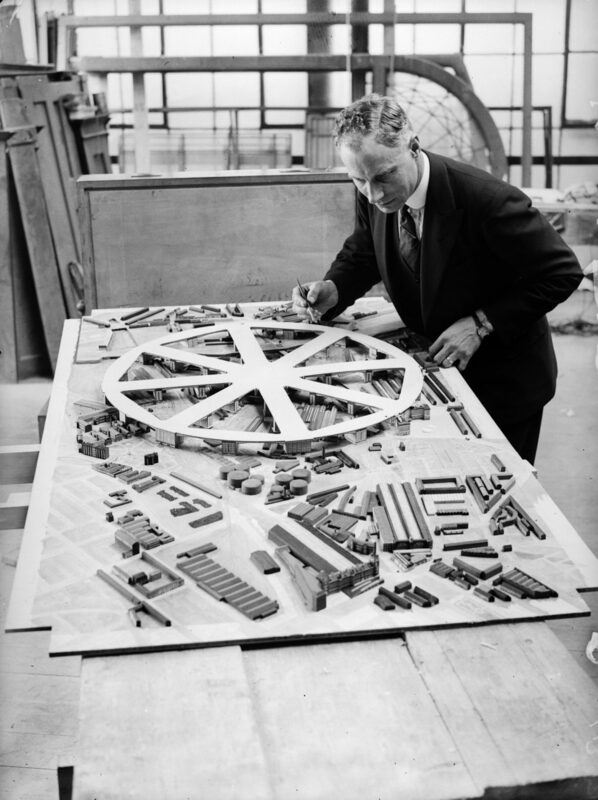 In the 1960s, Glover had another crack with a plan for a new Covent Garden vegetable market topped with what every 60s building really needed – a heliport. Few cities in the world have been as airport/heliport mad as London. In the 1930s and 40s, London considered an airport on top of skyscrapers in Liverpool Street, on the Thames itself, and even on the South Bank between London Bridge and Tower Bridge. The Southbank Centre was also suggested as a venue for a heliport in the late 1960s, and this is one reason why the Hayward Gallery and Queen Elizabeth Hall have such unyielding, tough and windowless exteriors – the architects thought they'd have to fight against aviation noise. The canned designs don't end there either. Despite Heathrow Airport being built in the far outskirts of west London, the city has struggled with air capacity in the 20th and 21st centuries, and in the 1970s plans were made to build a new airport at either Maplin Sands off the Essex Coast, or at Cublington near modern-day Milton Keynes. Neither materialised. In the end, an airport so near to central London and so whimsically fashioned was too much to swallow. But the idea of an airport in the Thames Estuary persisted. In the 2000s, airports that could replace Heathrow were proposed at Cliffe, or off the Isle of Grain (the latter was a Norman Foster plan). And then of course there’s the infamous 'Boris Island', a plan for an airport at Shivering Sands named in dubious honour of London's former mayor Boris Johnson, who pushed for it. The closest relative of the King's Cross Airport plan (that actually got built) is London City Airport in the Docklands, which opened in 1987 on a spur of land between two docks in the city's east. It's extremely popular with business travellers today because of its proximity to Canary Wharf and the City. However, it has a whiff of thoughtlessness in the way locals are treated (and would have been treated with the King's Cross Airport) because this is not a deserted area, there are streets and estates housing thousands right up against the airport's southern boundary in Silvertown, and for them it's a noisy co-existence. Only a few short years after Glover's King's Cross proposals, Berlin got a new terminal at the airport bang in its centre – the legendary and legendarily large Zentralflughafen at Tempelhof, now decommissioned. The motif of helicopters and planes landing on top of buildings would recur in piles of 'futuristic' architectural proposals for half a decade to come. Christopher Beanland writes about architecture, cities, the arts, music and the media.